Done, state #16. Read the post about the packet pick up here. My official finish time is still to be determined. 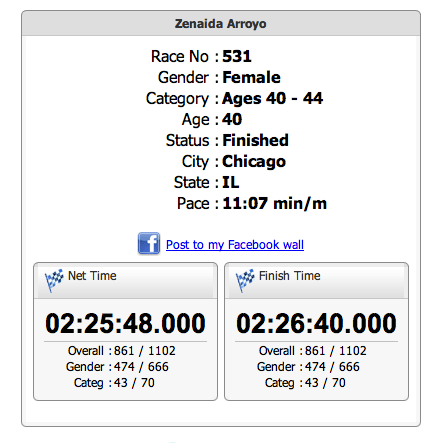 I’ve been back and forth with someone from the race and he has informed me that my finish time is 2:25:48 but yet on the website it is listed as 2:26:40. I know it is just a minute but the former is close to the time on my Garmin watch too. On Sunday morning my alarm went off at 6am and I cursed the 7am start time. Of course I got over that once I was dressed and drank coffee. I was thankful too because by the time I was done it was sunny and very warm. Run Raleigh was a small race. 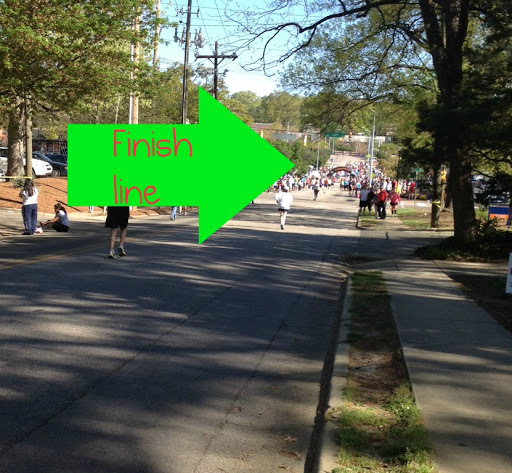 I lined up in the middle because I wanted to be as close as possible to the 2:15 pace group. 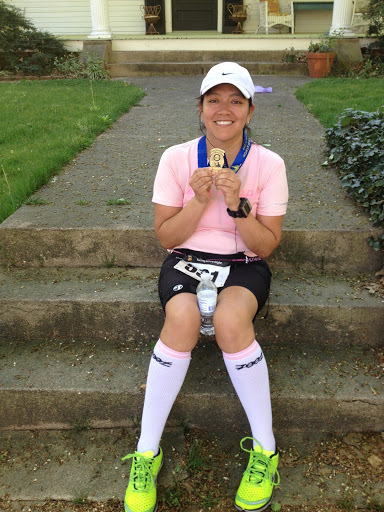 Of course the race was hilly! I decided to just deal with them. Why get all worked up and frustrated about them? They’re challenging and make the races a little bit more exciting. I have to embrace them and love them too. OK, maybe not love but at least like them right? Miles 1 through 4-9:57, 10:06, 10:32, 10:22 Not too bad here. Miles 5 though 8-10:03, 11:07, 10:17, 10:34 Pretty good here except mile 6. Miles 9 through 12-12:02, 12:19, 11:42, 12:43 Tired and am running slow. The course was a combination of running along the streets of Raleigh and through various trails. I did like the trails because it provided shade but it was not even pretty or exciting to look at. Thank goodness I had my music to distract me. There was no GU at all. Not even candy, oranges, or some other kind of sweets. There was water and Gatorade at various stops along the way. The volunteers were great! I knew I was close to the finish line when I passed my hotel which was about 4 blocks away. Then it was mostly going up and down various times. Towards the end it was a long stretch slightly downhill. Loved it! I felt like I was flying!! I was so happy to cross the finish line. I was hot, sore and tired. I then walked back to my hotel but had to sit on the steps for a few minutes to rest. As for the medal? I think it is OK. Nothing great or fancy. 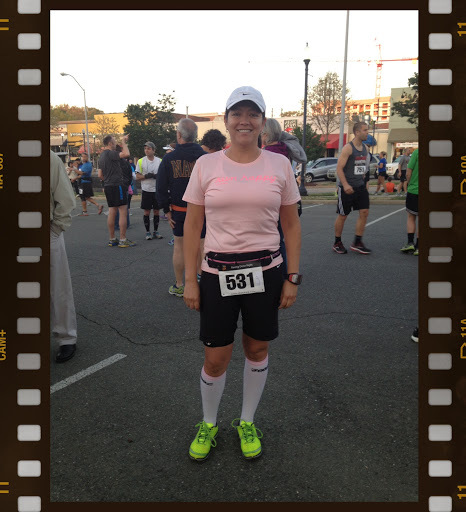 Next race is Rock ‘n Roll Nashville on April 26 where I will finally meet Laura from Absolut(ly) Fit. That pic above is adorable! Looking forward to seeing you in just over a month! Thank you! You are a cutie one too!! !